Along the Zion-Mt. Carmel Highway. 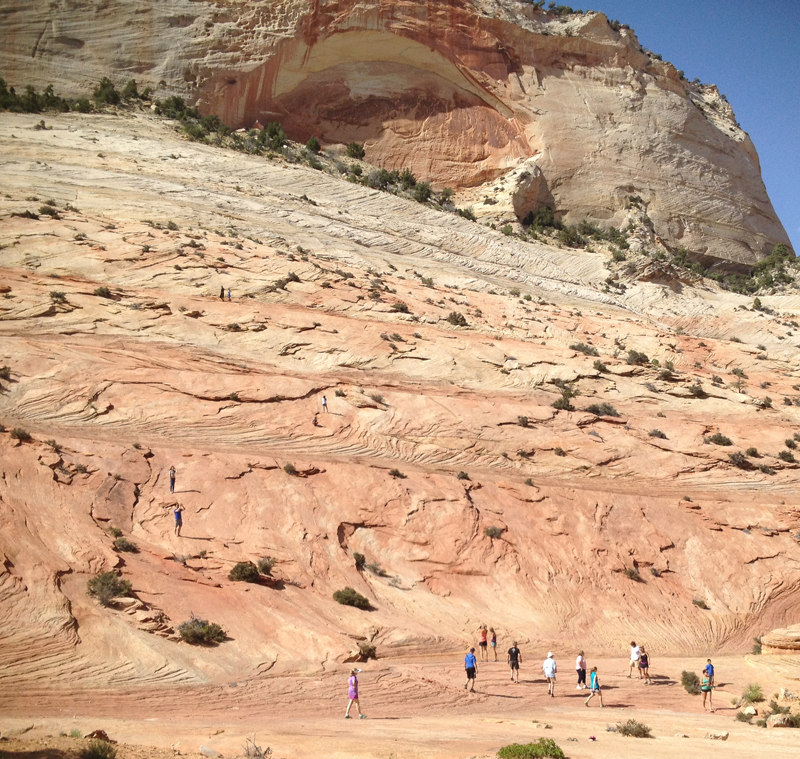 This is part of a series on Zion National Park by Kelly Monaghan and Sally Scanlon. Check out other articles here and here. Twelve miles of State Route 9 cut through the southeastern corner of the park, connecting the park’s south and east entrances (and requiring payment of Zion’s entry fee). The stretch is designated a scenic highway, and it more than lives up to that name. 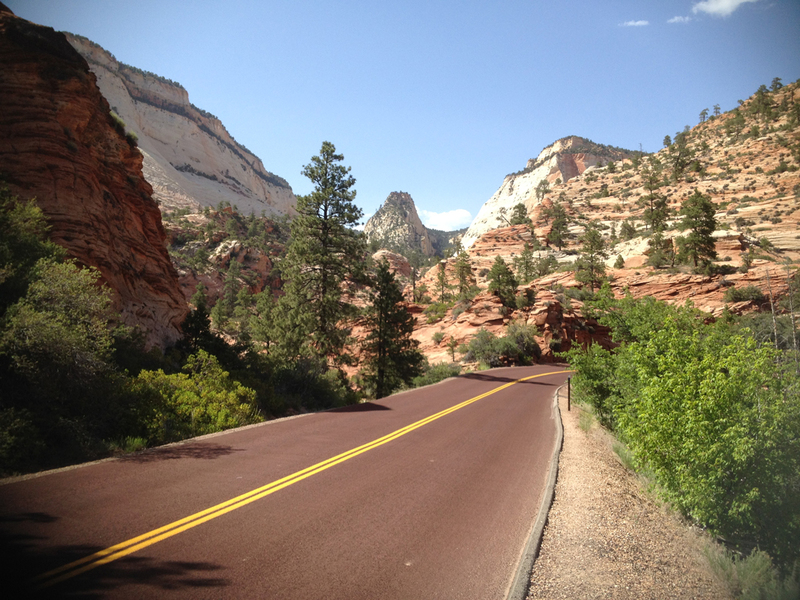 The road climbs steeply from the canyon floor, passing through Zion-Mt. Carmel Tunnel on its way to Checkerboard Mesa and the park’s east entrance. The 1.1-mile tunnel was the longest in the U.S. when it was completed in 1930. Its two lanes were plenty wide enough for two-way traffic back then, but a single lane can’t accommodate vehicles 11’4” tall or taller or 7’10” wide or wider. As a result, most RVs, campers, trailers, and the like require “one-lane traffic control,” which means rangers at either end allow only one-way traffic until the large vehicle passes through. Visitors requiring that service in 2014 pay a $15 fee per vehicle in addition to their entry fee. The fee is good for two trips through the tunnel (for the same vehicle) in a 7-day period. Sliprock along Zion-Mt. Carmel Highway. Once through the tunnel, the landscape changes dramatically. 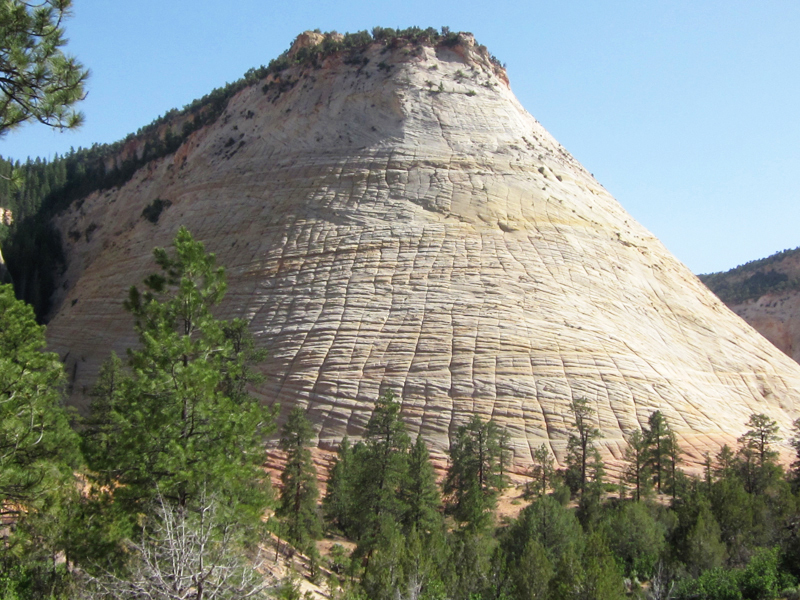 The drive showcases sliprock and “checkerboard” rock formations you don’t see on the Zion Canyon trails we hiked. Unless you are traveling on to Bryce Canyon National Park, you will turn around just before you reach the park’s east entrance. In addition to enjoying spectacular views from the many observation turnouts along the road, you can take a “moderate” hike on the rocky, mile-long (round trip) Canyon Overlook Trail. Accessed from near the east end of the Tunnel, the trail offers yet more views and lets you get up close and personal with the canyon flora. 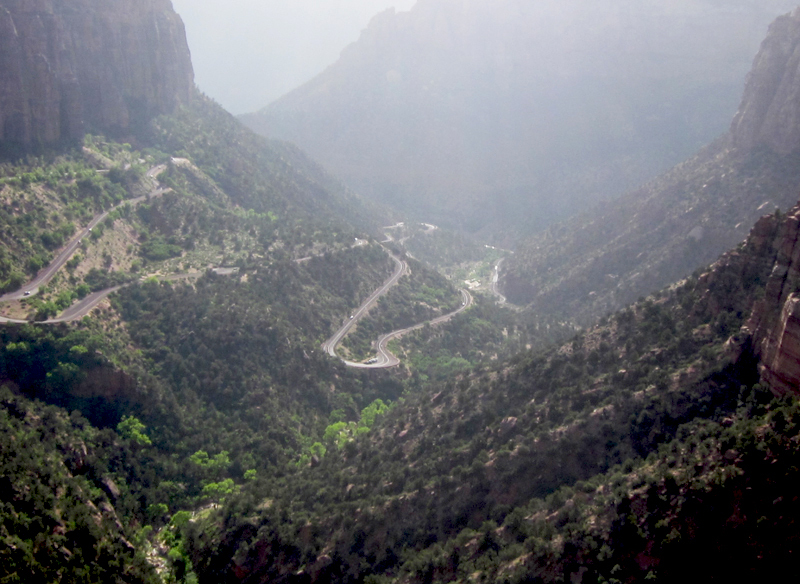 From its end, visitors can look down on the twisty road that brought them up from Zion Canyon. The Canyon itself lies ahead and far below them. Careful! The trail is sometimes steep and narrow with long drops to the floor below; not advised for those who have a fear of heights. Canyon Overlook: View at end of trail. This drive can be done as part of a day in Zion Canyon.